Greenlight for Startups & Non-Profits is designed to help key industry stakeholders valuable insights. Eligible organizations receive up to a 50% scholarship to Greenlight’s research products and services. We understand that startups have limited budgets for research. That's why we created Greenlight for Startups & Non-Profits. If eligible, you're granted a savings of up to $15,000 to use toward Greenlight research reports and conference tickets in the first year. The program lasts for 12 months, and if you choose to continue in the program you're guaranteed a 25% scholarship in year two! In order to be eligible, your startup must have less than $1M in funding, less than $1M in aggregate lifetime revenue, and be within 12 months of founding. 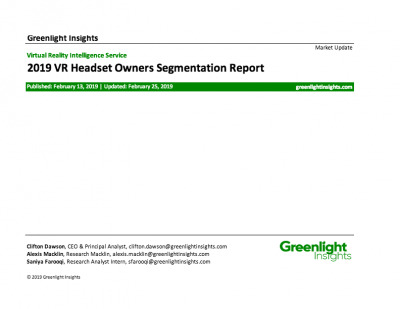 Greenlight Insights provides proprietary research to global technology companies, Fortune 500 brands, and innovative startups to help them make strategic decisions about the virtual and augmented reality industries. Our mission is to connect companies to insights that elevates the New Experience EconomyTM. Talk to us about this program by scheduling a phone call with Greenlight.